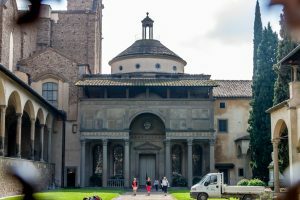 The Pazzi Chapel is one of the finest masterpieces of Renaissance architecture, built between the 1440s and the early 1460s in the main cloister of the Franciscan convent of Santa Croce in Florence Italy. Although the initial design is by Filippo Brunelleschi, the architect died in 1446 and most of the construction was actually made by his collaborators. The Pazzi Chapel is one of the last works by Brunelleschi, a sort of testament of the architect, speaking of beauty and perfection. The building was meant to be the chapter room of the convent and, at the same time, the burial place for the members of the Pazzi family. The construction was sponsored by the Pazzi family, a rich and ancient family, whose ancestor Pazzino de Pazzi, according to the legend, was the first one to enter in Jerusalem during the first Crusade. At the time the Chapel was built, the Pazzi were legitimate rivals of the Medici family and their bank was one of the largest in Europe. In 1436, Filippo Brunelleschi completed his greatest work: the famous dome of Florence Duomo. He was at the highest point of his popularity and, according to Vasari (Lives), his model for Palazzo Medici was refused by Cosimo The Elder, who preferred a smaller, less magnificent design by Michelozzo. This might just be a legend made up by Vasari, but perfectly fits what happened later: the model by Brunelleschi was used by the Pitti family for the Pitti Palace, which is basically Palazzo Medici in larger scale, while the Pazzi family also hired Brunelleschi for the Pazzi Chapel, which basically is the Old Sacristy (designed for the Medici family in San Lorenzo), again in larger scale. Considering that the Pitti and Pazzi families were the two biggest rivals of the Medici, can you see a pattern here? What’s somewhat strange is that actually no member of the Pazzi family is buried in the Pazzi Chapel. In 1478, the Pazzi try to assassinate Giuliano and Lorenzo de Medici, during the mass inside the Cathedral. This event, known as the Pazzi Conspiracy, is a disaster for the Pazzi. Giuliano de Medici dies but Lorenzo survives and the city sides with the Medici family, also because people were horrified by the unprecedented violence. Lorenzo’s revenge is terrible: all the members of the Pazzi family who were part of the conspiracy are killed, some of them arrested by people and killed without even a summary trial. It is decided that their bodies don’t deserve to be buried in consecrated land. The surviving members of the family are banned from Florence and all their properties seized.